Celebrate with OREO Pumpkin Cookie Balls! 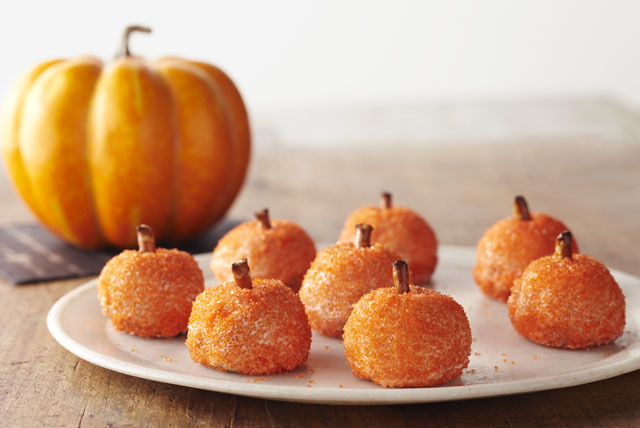 Rich, crispy and full of peanut butter flavor, these cute OREO Pumpkin Cookie Balls are the treat, not the trick. Shape into 40 (1-inch) balls. Dip balls in melted chocolate; roll in sugar to evenly coat. Place in single layer in shallow waxed paper-lined pan. Insert 1 pretzel piece into top of each for the pumpkin's stem. Chocolate and peanut butter are a winning flavor combination in these fun mini treats with built-in portion control. In order for the sugar to stick to the balls, roll them in the sugar immediately after dipping them in the melted chocolate. Omit colored sugar. Stir 3 drops orange food coloring (or 3 drops yellow food coloring and 1 drop red food coloring) into the melted chocolate before using to coat balls as directed.